800 officers and men of 46 Batallion Nigerian Army have been trained and ready for deployment to Darfur region in Sudan to compliment United Nations peace mission in that country. The selected Battalion had undergone four weeks extensive and comprehensive pre-deployment training in line with UN recommendation and vision of Chief of Army Staff (COAS), Lieutenant-General Tukur Buratai to enable them cope with situation in Dafur. The officers and troops are expected to take off in two weeks time. COAS, who believed that the officers and troops have been well trained and refreshed on their knowledge on managing crisis situation, urged them to be agile and responsive to any challenge that may arise bearing in mind the image of Nigeria and that of Army in their discharges. Represent at the graduation ceremony at Nigerian Army Peace Keeping Centre (NAPKC), Jaji on Tuesday by General Officer Commanding (GOC), 1 Division Mechanized Army, Major-Genral Adeniyi Oyebade, the Army boss said, the training further confirmed the commitment of NA to deploy quality peacekeepers as part of Nigeria’s laudable contributions for global peace and security. Buratai also cautioned the soldiers to avoid any ugly incident that can tarnish the professional image of NA and Nigeria which include uploading pictures and video of their operation on social media, drugs, human rights, protection of civilians in armed conflicts and sexual exploitation and abuse among others. ”Specifically, I want to warn you on the use of social media. While you are on operation, you may want to take photo shot of some good moment but you should be very careful while doing that. Avoid any picture or video that has to do with your colleague or operation. You are barred not to upload such information. It is prohibited to upload any picture with your uniforms while in operation because it will become a pragmatic problems for the Nigerian Army. “I expect all the officers to exercise firm command and control. You must ensure to look after the welfare of your men including their feeding and medical needs. You have no reason not to succeed because Nigerian State has provided you with all that you needed to do the country and your family proud”, urged the GOC. Earlier, Commandant, NAPKC, Brigadier-General Adamu Dauda told the gathering that NAPKC in its mandate has the responsibility of providing quality training for troops earmarked for peace support operations. 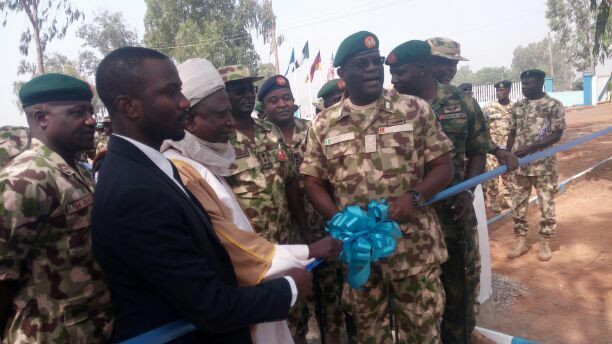 He restated that, the philosophy behind the training is in line with the Army Headquarters’ vision of deploying quality peacekeepers for peace support operations. “Due to significant respect for the professionalism of the NA at home and abroad, the role of the NIBATT was changed to Force Reserve Battalion (FRB). This unique training has equipped NIBATT 46 with robustness, agility and right frame of mind to efficiently handles any threat at Darfur”, he added.